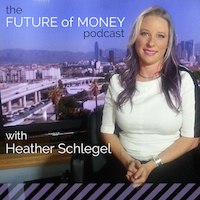 I'm pleased to formally announce The Future of Money Podcast! As preparation for the Future of Money TV interviews, I began conducting conversations with provocative thinkers and experts in monetary topics. After several I realized the discussions were too good to keep to myself. So I kicked off production for this (my first) podcast series. The first episode, about Money and Relationships, is with the fantastic Epiphany Jordan of Karuna Sessions. In it, we discuss how having more money doesn’t necessarily make you feel more financially stable and why more women want a different kind relationship as they increase their economic power. It's a fascinating conversation and Epiphany inspired me to consider the impact of money on relationships and vice versa. Special shout-outs to the first 15 Kickstarter backers. If you are interested in hearing more about Epiphany's work, please vote for the her SxSW panel exploring The Future of Touch: You Can't Hug a Status Update. What is the future of money, identity, banking, transactions, relationships and intimacy when you have a direct connection to the technology? For your consideration, I'm delighted to announce a SxSW panel submission for 2015 . Building upon past topics (The New Age of Money & The New Age of Technology Enhanced Intimacy), I've teamed up with IEEE for Biometrics & Identity: Beyond Wearables. 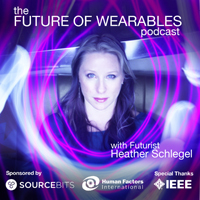 Wearables are a hot topic. I've recently become obsessed with the W3C EmotionML spec which is driving my passion in the topic of emotion/computer interfaces. I'll touch on that and build upon my previous work on the Future of Money. What is the ultimate human computer interface? The body? Emotions? Bio-chemicals? How could we use these interfaces for better control over our data, identities and for financial wellbeing? It's going to be a fascinating exploration. Please vote for the session to hear the possibilities!